After two successful terms in 2012 and earlier in 2013, the brand new-look Zestee Social Media School is available and accepting new enrolments. With a services menu offering something for every business,budget, learning style and location, course facilitator Renee Veldman-Tentori shares her extensive knowledge and enthusiasm for social media, backed up by broader marketing and business experience. Currently based in The Netherlands, Renee is a Dutch Australian who has created a custom-designed online learning platform for the Zestee Social Media School meaning that students worldwide can follow the online course. Designed for entrepreneurs who would like to learn how to capture the power and potential of social media to grow their business, on completion, students will understand the basics of tools such as Facebook, LinkedIn, Twitter, YouTube, Google+ WordPress Blogs & Websites, E-newsletters and more – and most importantly, be in a position to decide which are right for their business. Including important themes such as policy and procedure, monitoring and measurement and privacy issues, the Social Media for Business Online Course is available to join at any time from 1 September 2013. Priced to be affordable for small business, it offers exceptional value covering all the major social media tools and guiding students to create and begin to implement their own customised Social Media Strategy. 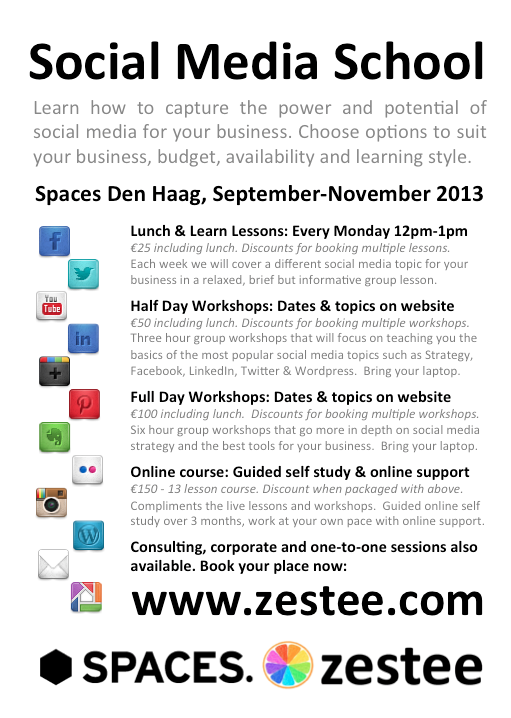 Half and full day face to face workshops are also available at Spaces in The Hague, The Netherlands. Excellent initiative! Renee is a true pro, very adept and at home in the social media. She has taught me a lot about this “brave new world” and has changed the way I communicate both professionally and personally, not an easy thing to do at an advanced age… I would recommend this course to anyone. thank you so much for the feedback and support Fiona, it’s been a pleasure to get to know you and work with you, your app and digital publishing knowledge is also fantastic, we’ll have to plan a class together soon!